Hot tubs are expensive, bulky, and usually out of the question if you rent. I made this flat-packed portable hot tub using plywood, ratchet straps, a waterproof vinyl liner, and some lightweight heating and pumping equipment. The tub consists of 6 panels in a hexagon configuration that slot together, friction-fit brackets on the top of each panel, ledges that friction fit to the brackets and panel tops, and of course a ladder. The pump and heating setup uses a portable on-demand liquid propane water heater, an electric water pump, a 12V battery, an in-line hot pool filling filter, and garden hoses. The pump equipment is fixed to a cart on pneumatic wheels that holds all the hot-tub parts and moves around like a dolly. The whole thing weighs about 200 LB. -CONTEST ENTRY- As an instructables employee, I'm not eligible to win any contest or challenge. This entry is only here for some extra exposure and searchability. Flat pack design has seen rapid development since the advent of the CNC machine as a more accessible fabrication tool. The ZETA Flatpack Lamp by ZPStudio is a great example of a complex 3D object made from a series of flat parts. If you're not used to working in 3D, designing a complex object this way can seem like a daunting task. But as you'll see in the Youtube tutorial, it's actually pretty simple. The key is to design the overall form of the object first using flat panels with the correct thickness and allowable sizes (anything that will fit on a 4X8 sheet of plywood), then create the slot joints that create the structure. As long as you pay careful attention to how the thing will be assembled, you'll end up with reliable results after a few failures. As my art teacher wife always says, materials don't lie. The best way to learn to make this kind of thing is to try and fail several times. When you've spent time and money on something that doesn't work, that lesson will stick in your brain for life. As with any design, it's important to sketch out the crucial details as early as possible. The example from my sketchbook shows my early thoughts on how the panels would fit together (slot joints with ratchet straps). The act of sketching can be called "thinking out loud" to quote Frank Ghery. When you sketch, you start to understand problems in a way that are practically impossible to work out in your head. A quick sketch is exponentially faster than working out most problems in the computer, so it's good practice to have a sketchbook as a constant companion while you're working in the computer. Any time you're going to build something big and complex, it is absolutely essential to build a scale model first. I found some 1/8" plywood and threw it on the laser cutter in order to test my idea. To scale a model, you take the thickness of the material you designed the project for (.72" in this case) and scale the line drawing output down by the appropriate factor. With a ratio of .72" to .125", I ended up with about a 6.25% size scale model. The crucial thing here is to make sure the size to thickness relationship is accurate. The slot joints needs to be tested for easy fitting. If the scale is correct, you will quickly see whether your model has the correct dimensions and tolerances. I needed to get a sense of whether the structure would withstand the force of the water. It's been a while since I took physics in college, but I had the impression that most of the pressure would be in the down vector due to gravity on the massive amount of water (500+ gallons, meaning over 4,000LB). To be sure, I wanted to test out whether there was any noticeable pressure on the panels. The test was a success: the slot joints fit perfectly and the water didn't seem to put any noticeable strain on the panels. I know this can't possibly be an accurate test for actual structural stability at full scale. For one, scale of the wood fibers in the 1/8" and 3/4" plywood remains the same, presumably making the scale model much less rigid than the large one. I also have no idea whether water pressure is directly proportional by volume, what the relationship between a garbage bag and the nylon waterproof membrane I used at the large scale was, what the tensile strength relationship between twine and ratchet straps were, etc. In any case, I got an intuitive feel for how it would work with water and felt satisfied to scale it up and give it a try. There are a lot of things to consider when making a hot tub. You have to get the water into the tub, you have to heat the water initially and keep it hot, and you have to keep the water clean. When the tub's going to be portable, the pump, water heater, and filtration system have to be lightweight and compact. The only portable hot tub I could find was an inflatable one that used an electric heater. Having worked in architecture for many years, I know that electric on-demand water heaters draw an extreme amount of power to make the water hot. Wanting this tub to be truly portable, electric was obviously out of the question- no amount of car batteries would do this job efficiently. The best option seemed to be liquid propane. You can buy the tanks at lots of different places,the fuel is cheap, and the heaters are compact. Knowing which water heater I was going to use, the literature told me that 20-80 PSI water pressure was ideal and that the water flow was 1.5 GPM at maximum output. I figured a 12V water pump that outputs 55 PSI at 3 GPM would provide sufficient pressure, and that it would be easy to find a 12V marine grade battery to run the pump. It seems to me there are two kinds of filtering are necessary: particles and germs. To keep particles from getting into the pump / heater system, I used a twist-on pipe strainer. In the sequence of things, this comes before the filter. For germs, fungus, and whatever other gross stuff you can't see, I went with a variation on Nature's Hot Tub Treatment's solution. It involves using an in-line tub filling filter and natural enzyme chlorine alternative treatment. Not having the robust pump/filter system that most hot tubs have, I decided to keep the in-line filling filter as a constant fixture in the process, then to add the enzymes later if I decided to let the water sit for any long period of time. I know this isn't the proper way to keep a hot tub clean and that the filling filter will need to be changed out frequently if this tub is intended to have standing water in it for any long period of time. But the tub is portable, so I don't expect water to sit in it for more than a weekend. Wasteful, I know, but it's a prototype- cut me some slack! I needed a 12V rechargeable battery to run the pump, and I knew a marine grade battery would be a good choice since there will inevitably be some dripping and spraying any time you're working with water connections. For the liner, I tried to find the most lightweight material I could find that's also waterproof. Durability is important too, because it rubs against plywood edges and whatever's on the ground all the time. The size here is also important- you need at least 14' in the longest run of the vinyl. I found a cheap solution that's 16'X20'- more than enough. Hot tubs are always insulated for obvious reasons- usually it's a massive spray foam job on the inside of the molded plastic shell. High R value insulation is bulky be definition, so I needed the best option that wouldn't take up too much space. Heat travels 3 different ways: conduction, convention, and radiation. Managing conduction and convection requires mass, there's really no (affordable) way around it. I found some cheap bubble rap / reflective foil insulation that would at least take care of the heat loss by radiation with 96% efficiency. 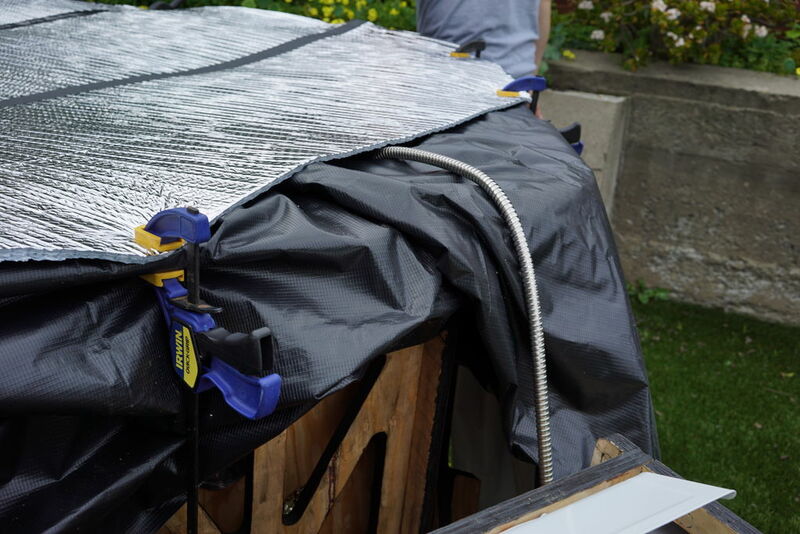 This insulation is used for both the panels (stapled on with a staple gun) and for a taped-together cover that clips onto the ledge at the top of the tub, keeping the heat in while it fills. I also got a bunch of garden hose fittings, 1/2" NPT fittings, adaptors, water lines, and so-on to make sure I could connect everything and get water through the system. And teflon tape- always have teflon tape! Step 4: Components: Hardware, Plywood, Etc. The project is made with 3/4" CDX plywood. The build takes 4 sheets at 4'X8'. I used 3 ratchet straps to keep the plywood together. I'm honestly not even sure if this is at all necessary to keep the water from blowing out the corner connections, but it does a great job of keeping the whole build rigid, and anyway- better safe than sorry. It's important to get a ratchet strap that's an infinite loop- there are eyelets in the panels that keep the straps in place, so hooks won't work with this design. I wanted the custom cart to be as versatile as possible, so I splurged on some pneumatic wheels. These rolled around without any trouble on sand, and took bumps on the way up and down small flights of steps. I used a 5/8" threaded rod for an axle, along with some washers and locknuts. The only screws needed for the whole project are the ones keeping the cart together. A handful of 1" wood screws will do the trick here. The grand total (without the propane tank refund) came to $632- a small price to pay for a hot tub that you can take to the lake in your station wagon! Once I had all the parts, I assembled everything to be sure it all worked as planned. The first image on this step is a diagram showing the sequence, and the second image has all of the main parts labeled. The water input goes through a 2-way splitter, that way you switch off the cold water source (lake, river, hose bib, whatever) and recirculate the warm water from the tub. The 2-way splitter is connected to the tub filler filter. The filter is connected to the pump which is on 12V battery power. The pump is connected to the water heater's input. The Water heater is connected to the propane tank, and outputs hot water to the tub. The tub has a recirculation hose that can be switched to the water heater input once the tub is fuel, to keep the temperature up. With this setup, I tested the pressure, temperature, and speed of the system. It took about 4 minutes to move about 6 gallons of heated water, meaning I could expect about 5 1/2 hours to fill the 500 gallon tub. The pressure was steady throughout the test, and the water was SCALDING hot with maximum gas an minimum flow of water. This test gave me enough confidence that the tub would work on a large scale. IF YOU DON'T HAVE A CNC MACHINE: Go to my Digital Fabrication by Hand instructable and see how easy it is to make the same kinds of projects using paper templates, a hand drill, and a jigsaw. It takes more time and you have to be precise, but it's totally doable even with a project at this scale. Just print out the PDF templates from this step at full scale 48"X96" sheets and follow the lines. The laser cutter is not the ideal tool for this application. If our Shopbot had been up and running I definitely would have used that. But this did the job for a quick prototype. I try to do most of my projects using tools that anyone can get at a hardware store, but this one was pretty ambitious and I simply didn't have the time to use a jigsaw and hole saws to cut out the complex panels. With a feed speed of 25 in/min and the power up to 100 on the Metabeam Laser Cutter, it cut through 3/4" CDX plywood almost completely on each pass. There was a small fire here and there (pocket of burning embers I should say), so I had to watch the cuts like a hawk and keep a spray bottle of water handy. Again, not the ideal tool for this material. With all the parts packed on the cart, the whole piece is 42" wide, with a 8 1/2" protrusion encasing the pump and heater. This means it fits in the back of my station wagon whole, missing the wheel wells because of the 8 1/2" protrusion. I strapped the panels to the top for this trip to save space inside the cabin for other stuff. It rolls around pretty easily as a dolly, and it only takes one ratchet strap to fix the panels to the dolly. I decided to take the tub up to Lake Tahoe for the first use. The view is amazing at Fallen Leaf Lake, and there's a public beach that allows swimming year round (though oddly enough, no one was swimming in February). I figured there wouldn't be any contamination issues with a new vinyl liner, new equipment, and a few people in the filtered water. It's a swimming lake after all, so I didn't see how it would be any different. Also, there aren't any "NO PORTABLE HOT TUB" signs, so I figured I was in the clear. I didn't explicitly ask any park rangers about it, because I figured it's better to ask forgiveness than permission for something like this. Why would anyone stick their neck out and sign off on something new that they don't understand? After a little sanding and a coat of water based polyurethane, I screwed together the cart and did a couple of dry-fit tests of the brackets. I've done friction fit projects with the same settings before, so there were no unfortunate surprises. Designing the project with .72" material thicknesses and no assembly gaps makes for a nice snug fit on all the parts. All you need to assembly the tub is a rubber mallet, and it helps to have a second person (but it's not necessary). The trick is to start with a panel with the "Up" tabs- holding that one in place, you can add the other "Down" panels to its sides, giving you a stable setup to work with. The last piece is the hardest, because it's an "Up" panel hooking into 2 "Down" panels, but it didn't take more than 30 seconds to get it to fit with Mikeasaurus lending a hand. Once the panels are in place, it's best to lace in the ratchet straps, and tighten the whole perimeter. The fitting is so precise that the ratchets really only serve to keep the tops of the panels aligned. With the tops of the panels aligned and locked in place, I hammered in the brackets on each top panel, followed by the ledges. All of the components are friction fit, so there's no need for fasteners here. When I assembled the ladder, I found it compact enough to keep together- no need to repeatedly put this together and take it apart. All told, it took about 15 minutes to assemble the whole tub! 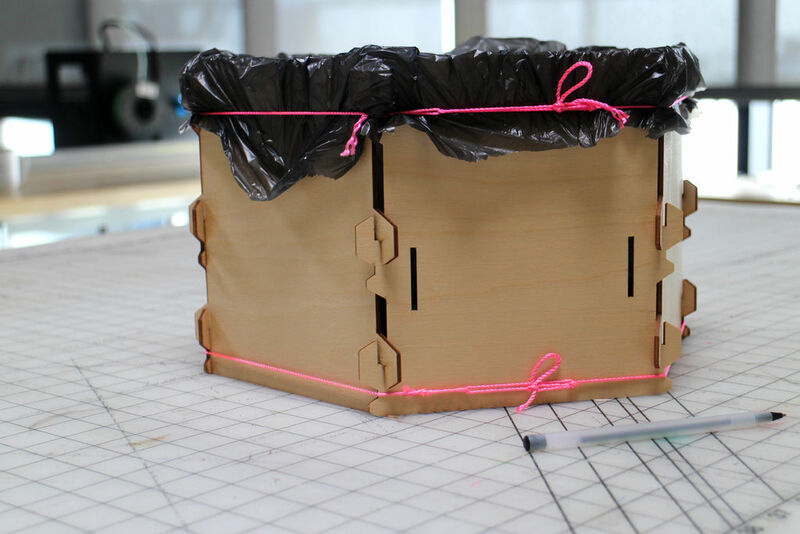 It's incredibly sturdy; you could walk around the top ledge and not worry about anything popping out or breaking. With the wooden structure completed, I stuffed in the vinyl liner. This part wasn't very carefully controlled- I basically pulled the liner so that there was enough slack around the edge to let the tub fill up. With the tub set up and the liner in place, I hooked up the pumping / heating system to start filing the tub from the lake. But when I connected the battery and started the water heater, nothing happened! After some trouble shooting involving priming the hose (maybe it was too high above the water source? ), adjusting the water level valve inside the heater, and hooking up the pump to a nearby hose bib, it dawned on me that the elevation might be the problem. Lake Tahoe is at 6,500 ft. elevation, and I tested the system in San Francisco at seal level. When I got back within cell phone range, a quick google search made it clear that altitude has a serious adverse effect on water pumps and propane heating elements- lower pressure in the atmosphere = lower pressure in the system, which means it simply didn't work. Information that would have been USEFUL TO ME YESTERDAY! There is no better way to learn than through mistakes- I won't be forgetting this lesson any time soon. With the Tahoe altitude against me, I decided to go back to sea level and set up the tub in a friend's back yard. It's not as scenic, but at least I could pump hot water! The water heater comes with its own propane hose that includes a back flow preventer valve. This is SUPER IMPORTANT! It goes without saying that propane is extremely explosive, and it’s ill advised to use it without manufactured safety features like this. If you’re going to make one of these yourself, you’ll be fine as long as you don’t monkey with the setup recommended by the manufacturer. Attach the propane hose to the tank and the gan input on the water heater. It’s important to hand-tighten this hose to prevent stripping the threading- this of course would be a serious hazard. Connect the water hose to the y splitter at the end of the filter, and put the other end in the water source. In the off-grid scenario, you’re just dropping the end of the hose into the lake or river, but in a back yard situation you’re just hooking it up to a hose bib. There is no need to connect the pump to the battery at this point, because the pressure is coming from the hose bib. The water heater has two valves: gas and water flow. To start this heater, you set the water flow level to MAX and the gas level to HALF. The water will start flowing through the system, after which time you open the valve on the propane tank all the way. With the ignition switch on (it uses D batteries, not included), the water flow starts the igniter clicking, which in turn ignites the gas burner. With the gas on and the water flowing, the heater will produce hot water until the propane tank runs out or the pressure drops below 19 PSI. There is an inverse relationship between the heat of the water and the flow rate of the water. With the gas turned up to max and the water turned up to max, the water was lukewarm because the pressure of the hose bib was very high. It's common sense: if the propane element has to heat more water, the heat will be distributed over more volume, so the water will be cooler than the same amount of heat with a low volume. The trick here is to be patient. Set up the tub in the morning, let it run on low water flow and high heat for 6 hours, and you'll have a nice hot tub by nightfall. IMPORTANT: The water heater I bought for this project has a tendency to blow out when it's windy. I had to restart it several times throughout the day because of a gust of wind. This could be mitigated by making a baffle around the heater to keep the wind from blowing through the heating element while still allowing it to vent. It goes without saying that when the flame goes out, the gas keeps flowing, so be careful! Since the tub takes 6 hours to fill at a high temperature, I made a cover out of the foil/bubble wrap insulation used on the side panels. I figured this would help mitigate at least the radiant heat escaping. This part is pretty simple, you just roll out the insulation, clamp it down, tape it together in sections, and trim it until you've got a cover in the shape of top of the tub. As you'll see later, this proved to be an essential part of the project- it really kept the heat in! With the cover on and clipped in place, trimmed the liner around the top edge of the tub, giving enough slack so that I could fold it under and tie it down with some rope with a trucker's hitch knot. With the cover on and the water pumping, it's the waiting game for about 4 1/2 hours. For this hot tub, I used some off-the-shelf Ikea stools for seating. The feet seemed a little small, so I sliced a hole in some tennis balls and fitted them to the ends of the legs as feet. These work well for the tub because they're moveable- it's nice to be able to reposition inside the tub to get comfortable. In the interest of breaking everything down and taking it home on the same night, I upped the water flow throughout the filling to about Medium. This allowed the tub to fill in about 4 1/2 hours, but the temperature only got up to about 90ºF (32ºC). This is definitely comfortable for a hot tub, but if you turned down the flow to MIN, you could definitely get the temperature up as high as 110ºF (43ºC). FYI, 104ºF (40ºC) is the recommended temperature for a hot tub according to the pros. Turn the gas regulator on the water heater to MIN, then turn the gas tank off. Switch the splitter from the cold water input to the recirculating water input. The second (shorter) garden hose goes in the tub and attaches to the other end of the splitter. Attach the water pump to the 12V battery. Once the water is pumping, turn the gas regulator to HALF and turn the water flow regulator to MAX. With the igniter switched on and the propane tank valve open, the igniter will start automatically. Once it's lit, set the gas regulator to MAX and the water flow regulator to MIN for maximum heat. I haven't tested it, but I suspect that recirculating the water will get the tub even hotter over a long enough period of time. This could be useful if the water source is particularly cold. If the water from the hose bib was about 60ºF and the tub was at 90ºF, then I would assume you could pump in 40ºF water from a cold lake, get that up to 70ºF while filling, then get up to 100ºF with recirculated water in a covered tub. It would take 10 hours, but if you started early in the morning you'd have a treat at the end of the day. Using a stool as a step, it's easy to get in and out using the ladder. The height of the rim was perfect for me to prop my arms up on (I'm 6'-1"), but the whole thing could probably stand to be a bit lower to accommodate people of all sized. Maybe 38"-40" tall. The movable stools make it easy to get comfortable, the ledge makes a great table for a drink, and the pump and heater are very quiet (much quieter than a typical hot tub). Drain the water: There's no drain in the liner (I don't trust myself to make one that doesn't leak), so you have to siphon it out. This is really easy, you just prime the hose by submerging it underwater and moving it around until all the bubbles are gone, then hold your hand over the open end to keep any air from getting in, then put the end on the ground where you want the water to drain. As we all remember from elementary school, if the drain outlet is at a lower elevation than the drain inlet, gravity will do all the work for you. With two hoses, the tub was drained down to about 12" deep within the hour. Pull out the liner: With the water sufficiently low, I removed the ratchet straps and the panel that was facing downhill. A little tugging, and the water pushes against the open end and drains out. The slight slope of my friend's backyard made this really easy- no water was left to get in the way of folding up the liner. Now that the liner was trimmed, it had a nice manageable circular profile, which I think is going to make it much easier to install for the next use. Lesson #1: Do your research first! Half an hour reading reviews of the products on google would have told me that this wouldn't work at high elevation. Lesson #2: Propane lasts! After 7 hours straight of running on full, I only went through about 1/2 of a tank. This is definitely the best way to heat the water. Lesson #3: Make it lighter. The 3/4" plywood + ratchet strap scheme was more than enough to keep the whole piece together. If I were to make a second pass at the design, I would use 5/8" or even 1/2" plywood to cut down the weight. I'm sure it would work just as well with a bit of tweaking, and I might be able to get the weight down to 150 LB in a best case scenario. Awesome assembly project! Extremely detailed instructions! Bravo! Wbendick, do a google search for "dog bone joints". The trick is to make a semi circle at the end of each right angled joint- this allows the slots to meet at right angles without any extra work. It's what I'd call a tool-specific aesthetic, so if you're not okay with that, I find the best way to get inside-right-angles is to use a large file with one flat side. This makes short work of those pesky filleted corners. The part pdfs look incomplete. I don't see the ladder. Can you post the rest? I'd like to cut this out. Right you are! Just updated step 6. Please post what you make! I'm having some trouble generating gcode from the pdfs. Could you post the original file you designed the parts in? Just added a DXF, a DWG and the "F3D" Fusion 360 file I used to design it. Hopefully these will have everything you need. Are you using a shopbot? Thanks for the files! I'm using the CNC router at Ace Monster Toys. http://wiki.acemonstertoys.org/CNCRouter It's not a shopbot but I'm not sure what it's called. Since I'll be be cutting it with a bit thicker than a laser beam the inside angles wont be sharp but have a 1/4" radius to them which will interfere with being able to put it together. My plan was to cut the extra material off with a jig saw. Is there a better solution to this problem? I'm new to cnc wood cutting. if you ever do this with a simple 42in deep pool for continuous swimming in place, I will be forever grateful. An aqua-treadmill? I like it! This is really cool. FYI Water pressure is solely dependent on the height of the column of water, unaffected by volume. Right. That's what I'm getting at with the difference between this and the inflatable ones. The inflatable ones I've seen have a very short column of water (you basically just lie down in them), because making it taller would increase the pressure on the walls. Thanks for the science! You don't basically lie down in them. Sitting straight upright, the water level is nearly neck height. How hot does the water get? Have you used a thermometer to find out exactly? I'm with you on the 101º temp, it seems ideal. The test in the video only went up to about 90º, but that's because we rushed the filling time. More water flow = less heat. You can rush the fill, but then recirculate the water through the heater/pump to continue heating things up. Just put both ends of the hose in the tub (shut off pump, cork intake end of hose, move intake into tub, uncork, turn pump on). It's actually set up with a Y-splitter with ball valves- makes this much easier! Up to 104, which in my opinion, is too hot. Yes, when experimenting with ways to heat it up faster I used a thermocouple and digital readout.